The Hole Thing, initially a felted clothing line, continues to expand into housewares. In addition to felted candle holders, garlands and felted bowls, The Hole Thing now has felted vases, coasters and trivets. Louise's work is the perfect example of a strong design element taken in many different directions. For sale in her Etsy shop. Crystal of Vintage by Crystal just completed a "Woodland Circus Creatures" set made of spun cotton. Included are a chipmunk-juggling bear, an acrobat team of vixens, a nut balancing squirrel, a sword swallowing reindeer and a wolf clown. 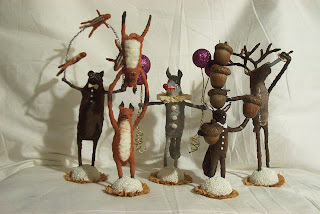 This whimsical circus family is for sale at her Etsy shop. They are available individually, but who wants to break up a family? Read more about them on Crystal's blog. Thanks to Betsy of Stonehouse Studio for compiling this and many other New Work Wednesday posts!